I recently wrote a post on my obsession with Jeni's Splendid Ice Creams and had also previously expressed excitement about the impending publication of Jeni's cookbook. When the book arrived two weeks ago, I read it almost cover to cover, and was immediately impressed. I know I'm biased, but I wasn't quite sure what to expect from the cookbook beyond what I had already seen in the Food and Wine webpage a few years back. Turns out the cookbook was really a wonderful investment. In it, Jeni offers valuable tips about equipment, ingredients, and how to balance ingredients, I love how she starts right out with the four basic steps so you know what to expect. She also gives great tips on what needs to be done ahead of time, so you don't have your heart set on making ice cream right now only to realize you needed to to have chilled your ice cream bowl yesterday. Then, of course, there's the 100+ recipes! My goal had been to use Jeni's techniques to make my own flavors of ice cream, which I'm sure I will get to at some point, but as soon as I got to page 158 of the cookbook, I knew which flavor would be first on my list to try: Gucci Muu Muu. I don't quite get why it's called that, but I recognized from the description and the ingredients that it was basically an old favorite of mine that was discontinued called Coco Curry Cocoa (or was it Cocoa Curry Coco? 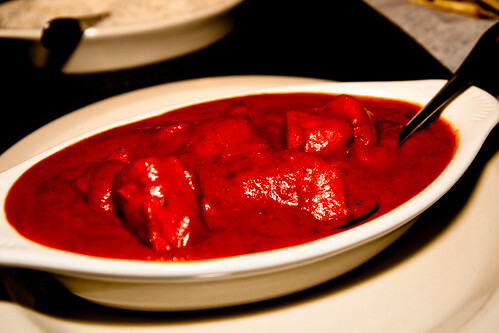 I can never get that straight): Chocolate ice cream with curry and coconut. In other words, an ice cream that combines three of my favorite flavors in the whole world! I remember how bummed I was when Jeni's decided to scrap that flavor some years ago, so I was ecstatic to see the recipe right there in the book! 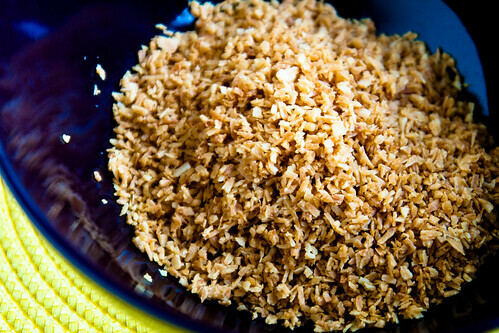 Toasted coconut to be mixed into the ice cream - yum! Boiling the ingredients. Do this for exactly 4 minutes - no more, no less! And after chilling, churning, and freezing...Tada! So how did it turn out? Pretty good, I'd say. I don't think it's quite like the real thing because the best chocolate I could find in stores is Ghirardelli but I don't think that's what Jeni had used, even back then. 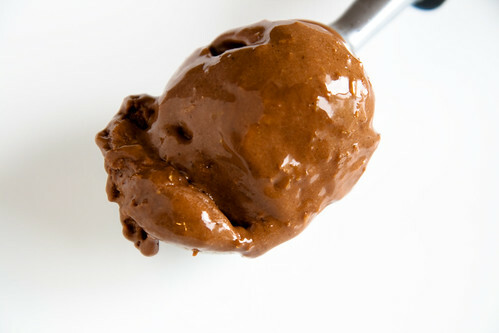 I know her choice of chocolate these days is Askinosie, which I know I would love considering how much I'm addicted to the Askinosie Dark Milk Chocolate Ice Cream, so I may have to stock up on those for my future ice cream making attempts. I also realized that I had made one mistake that likely made the batch too thick and hard to freeze. During the step that involves boiling the liquid ingredients, I misunderstood the instructions in the book where it says "...bring to a rolling boil over medium-high heat. 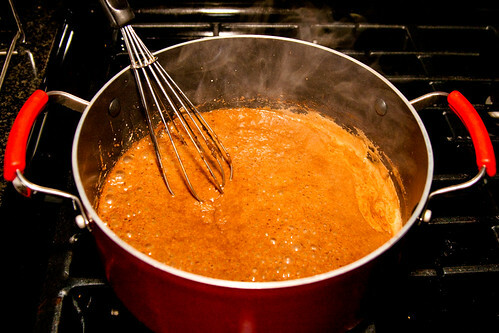 Add the cocoa, whisk until incorporated, and continue boiling for 4 minutes." I had started timing my 4 minutes only after the cocoa had been completely incorporated into the liquid, which added another minute or two to the overall boiling time. After consulting the amazing Jeni herself, I learned that the 4 minutes referred to the total boil time, as any longer would result in too much evaporation. 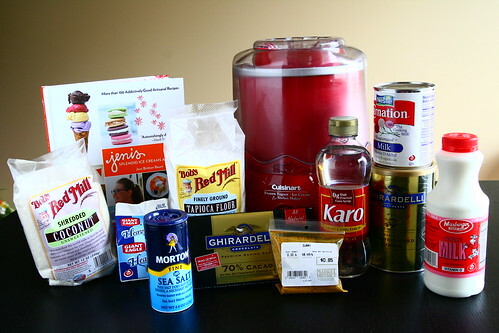 And yes, that's the great thing about Jeni; she is taking time to interact with at-home Jeni's ice-cream makers on her forum and offering wonderful tips to everyone who has a question or is running into a problem. I mean, how awesome is that?? Sometimes I read the posts just to learn. Overall, I really love this cookbook, and I hope to try a few more recipes soon. I'm thinking my next attempt would be a variation of the Gucci Muu Muu, maybe even using the Queen City Cayenne recipe as a base, but using wasabi powder instead of curry powder (and maybe skip the coconut too). I think the chocolate-wasabi combo would be just divine! I'd also like to try the Rum Ice Cream with Toasted Coconut, which is a flavor Jeni's once offered for a few months and I haven't seen since. I'm so glad to see that in the cookbook as well. I'd also like to make something with taro and purple yam (not together). Lots of grand plans, very little time! Also check out We All Scream for some really cool illustrated ice cream recipes. I noticed a new posting for Thai Pineapple Curry Ice Cream and I might just have to add that to the list of flavors to try! UPDATE 8/13/2011: I found out after this post that the reason for the pudding-like texture of the ice cream was because there is a typo in the recipe, which calls for 1/4 cups of heavy cream when it should read 1-1/4 cups! After lunch at Forgotten Taste Famous Pierogies, I went next door to Yum Frozen Yogurt for dessert. Yum, a self-serve froyo shop, is fairly new, and was voted Favorite Frozen Yogurt by readers of Whirl Magazine earlier this year. On this visit, I picked the strawberry and the cupcake flavors for my frozen yogurt, and topped it up with some fresh strawberries, pineapple chunks, and coconut flakes. The strawberry frozen yogurt was not too bad, but the cupcake was definitely the better of the two. I have been to Yum a few times in the past, and they do whip up some good froyo. I distinctly remember their Green Tea and Irish Mint flavors being quite tasty. Of course, like many self-serve froyo shops, Yum rotates its flavors, so you never really know what you're gonna get on a given day. I think the quality of Yum's froyo is comparable to the fabulous Razzy Fresh, which means it is awesome. Personally, Razzy Fresh is still my favorite in town only because I prefer the options they have over Yum's, which is not a knock on Yum at all. 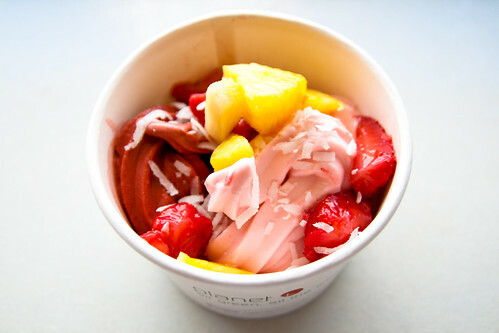 If you happen to be in the Wexford area and craving frozen yogurt, Yum is a brilliant choice. 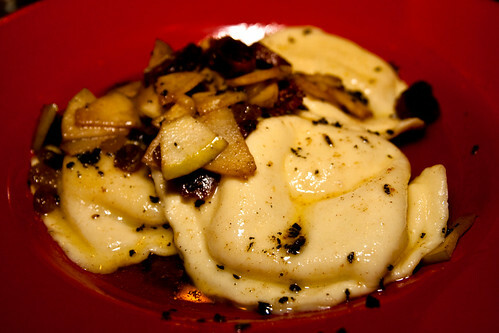 Forgotten Taste Famous Pierogies is a curious little shop. I have never seen a restaurant more unassuming than this place, where the only sign above the restaurant says "pierogies," with the actual name of the restaurant nowhere to be found. In fact, I had driven past this place on a number of occasions, assuming it was just a simple take-out place. I mean, what restaurant doesn't have a name? 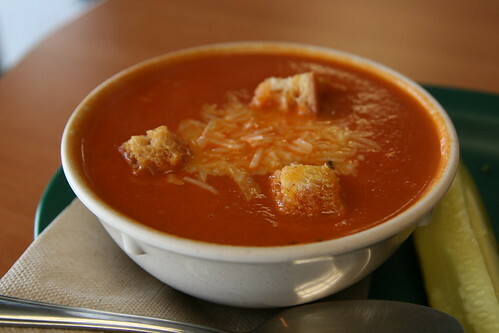 Well, Forgotten Taste does take-outs, but there is also seating available for dining in. The atmosphere is pretty minimalistic with several tables on the inside. There is a patio out back overlooking Rt. 19, but no seating. There are, however, two small tables at the front of the restaurant facing the parking lot. You order from the cashier, and your food is served on styrofoam plates on a red plastic food court tray. 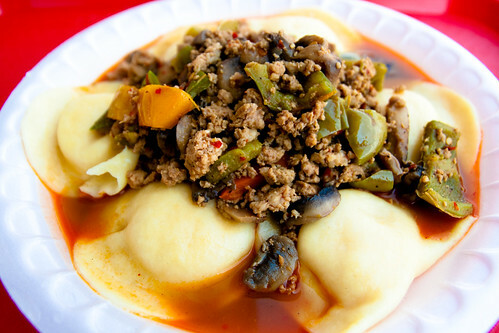 Based on Burgess' recommendation, I ordered the Hot Sausage Goulash over Pierogi. The goulash was as good as Burgess had promised. The pierogies were also cooked to perfection; the wrapper tastes fresh and perfectly al dente, unlike some soggy versions I've had in the past (there is nothing worse than overcooked pierogies! 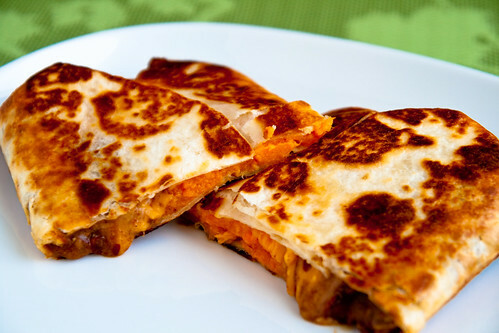 ), while the cheese and potato filling was also fabulous. 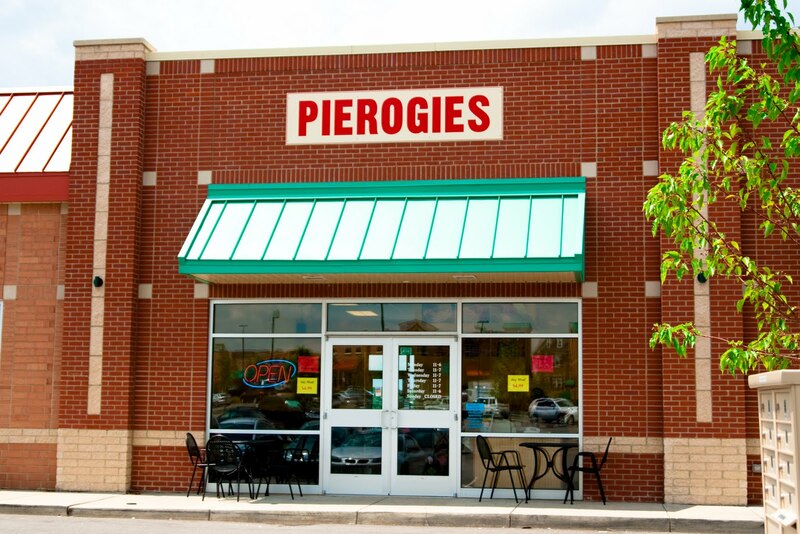 This place really does serve up some tasty pierogies. 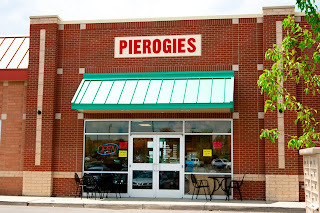 It wasn't until I had already placed my order that I saw the sign saying that they can either boil or deep fry the pierogies. Next time, I'm trying them deep fried, though I must say the boiled version was a lot better than I had expected. Also, if you happen to be in the area on Monday and Wednesdays, you can get a meal for a discount price of $4.99, which is a great price for great food. There is also another location in Cranberry and a take-out location in Moon Township. 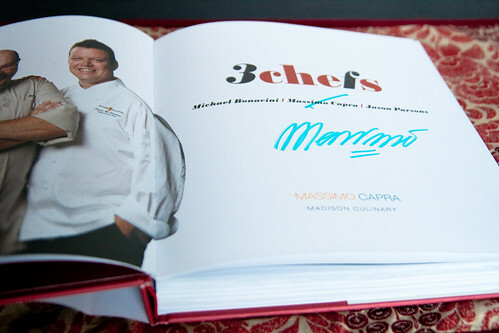 Several months ago, my parents excitedly presented the three of us each an autographed cookbook called "3 Chefs: The Kitchen Men" featuring recipes by Michael Bonacini, Massimo Capra, and Jason Parsons - three chefs who have a cooking show together on Canadian TV that I know nothing about because I don't exactly have access to Canadian TV. Since then, I have come to learn that these three are celebrities of sorts in the culinary world. Michael Bonacini, in particular, is the Bonacini half of the Oliver & Bonacini enterprise that operates several restaurants in Toronto - one of which, Auberge du Pommier, is high on my wishlist. I remember flipping through the cookbook when I first got it and being somewhat intimidated by the recipes, so I stashed it away and kind of forgot about it. Fast forward to last week. My family was looking at venues for a party we are to host next year, and one of the venues under consideration is catered by Oliver & Bonacini. Not surprisingly, I was rooting hard for this venue, but alas, for a number of reasons we are going with a different place. Catering by my dream team was not in the cards after all. To soothe my disappointment, I decided to fetch my 3 Chefs cookbook and try one of Michael Bonacini's recipes, as if that would somehow make up for my loss. Well, some people practice "shopping therapy;" I call this "cooking therapy." 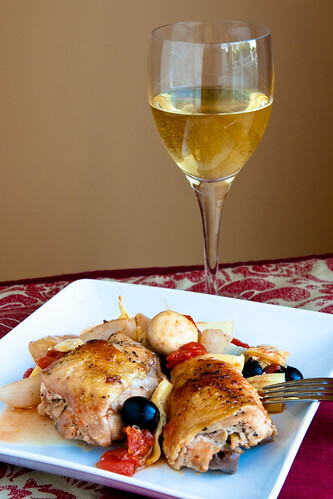 I decided to try the Country Style Pot Roast Chicken with Sherry because it seemed less intimidating than all the other recipes. 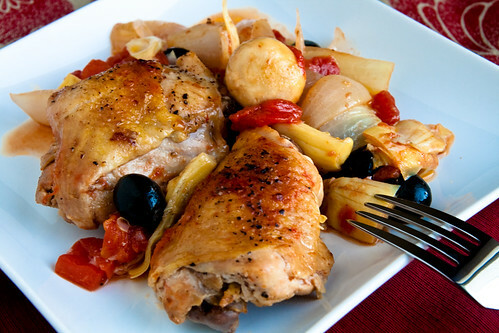 Instead of a whole chicken, I decided to use only chicken thigh because that's the part of the chicken I like best anyway. 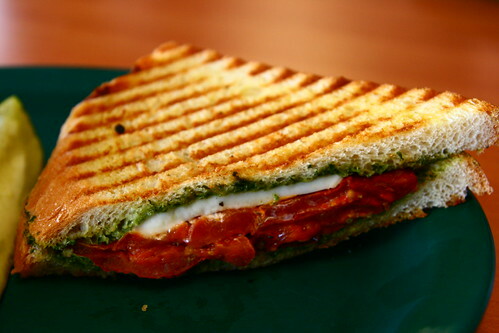 I also had to substitute a couple of the ingredients because I couldn't find them at my local store. Instead of sherry vinegar, I just used plain old red wine vinegar, while pearl onions were replaced by chunks of Vidalia onion (about 2 onions). Of course, the following week I went to McGinnis Sisters and saw pearl onions there, when I no longer needed them. Go figure. 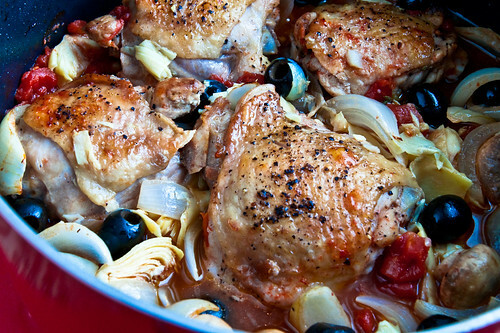 In any case, the cooking itself wasn't too bad, although I had to split the batch in half because my pot wasn't big enough to hold 3.5 lbs of chicken plus all the other ingredients. And the result? I was floored. 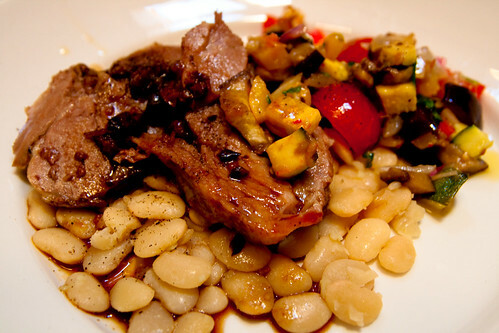 Bonacini is so successful for a reason - the guy can come up with a darn good recipe. Everything from the tartness of the juice and the articoke hearts to the slight crispiness of the chicken skin from broiling was divine. I will most definitely have to try this again soon. Anyone who knows me knows I love Jeni's Spendid Ice Creams from Columbus, Ohio. Some have even called me "fanatical" to my face. Thus, it is only fitting that I devote some blog space to my beloved Jeni's. Growing up, I have always loved ice cream, but I had the fortune of living in Columbus when Jeni Britton Bauer opened her first Jeni's shop inside the North Market in 2002. I forget now how I came to discover this little gem, but I was immediately drawn to its unique and daring flavors. Some of my favorites include the Thai Chili (now known as Bangkok Peanut), with peanut butter, honey, toasted coconut, and cayenne pepper; the Salty Caramel (need I say more?) 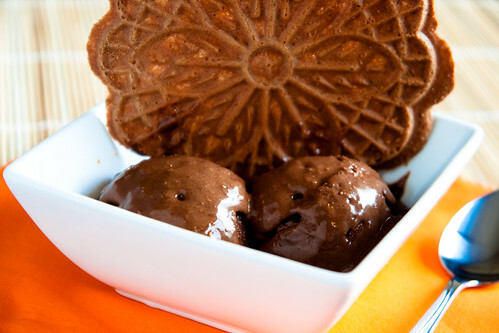 and Coco Curry Cocoa (since discontinued), which was a chocolate-based ice cream with curry and coconut. Where else can you get flavors like that?? Another thing I love about Jeni's is that a number of its flavors rotate based on the season. Some of my summer favorites include Backyard Mint and Sweet Corn with Black Raspberries, while every winter I stock up on Dark Chocolate Peppermint. Jeni is also constantly creating new flavors - like the relatively newer additions Askinosie Dark Milk Chocolate, Brambleberry Crisp, and Brown Butter Almond Brittle that I've become hooked on - so there is never a lack of novelty. Thanks to Jeni's, I have become a true ice cream snob. I scoff at other brands of ice cream. Ben & Jerry and Haagen Daaz are a waste of money and calories in my opinion. Though I'm always open-minded and willing to try "local favorites" that people have recommended - like Gifford's and Moorenko's in DC and Dave & Andy's and Oh Yeah in Pittsburgh - I have never been satisfied. So what is it about Jeni's that warrants its spot on Bon Appetit magazine's list of Top 10 ice cream in the country? In addition to its creative flavors, Jeni's ice cream is very creamy - creamier than other brands. I have begun to notice that other ice cream brands are just too watery or too soft. Also, equally important is the fact that Jeni's uses fresh and natural ingredients. The cream comes in its freshest form straight from Snowville Creamery, a farm located just two hours away. 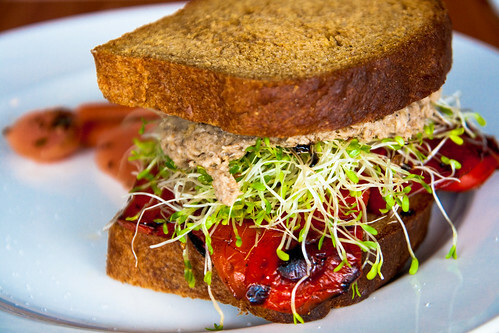 Many other seasonal ingredients are also sourced locally. The ingredients list contains nothing you can't pronounce so the ice cream tastes exactly how it should taste. Pistachio and Honey tastes like real pistachios and honey, and Backyard Mint tastes like fresh mint from the farmer's market - and no icky green food coloring either. When you combine high quality ingredients and exotic flavors in pleasantly surprising combinations, you have a winning concept that has gone from one little stand inside the North Market to (as of this writing) eight additional shops in Ohio and one just about to open next week in Nashville, Tennessee, in just a few short years. In addition, in the past couple of years Jeni's has begun to partner with local businesses spanning 31 states across the country to sell pints of their goodies. In Pittsburgh, you can find pints of Jeni's at Whole Foods in East Liberty and McGinnis Sisters in Adams Township (that location only), though I'm still holding out hope that Jeni's might someday decide to open up a standalone shop in Pittsburgh. Nothing beats being able to sample the different flavors and having many more options than what Whole Foods and McGinnis Sisters happen to stock. This is why I still order most of my Jeni's ice cream online and have it shipped to my door, packed in dry ice. 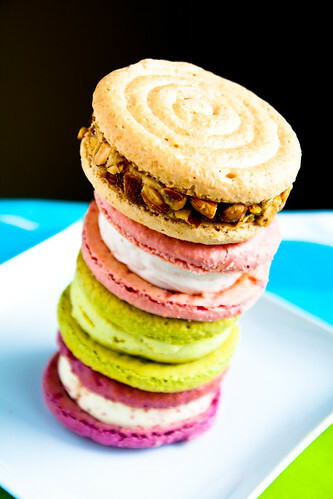 One Jeni's product you can't get at one of their retail partners is their macaroon ice cream sandwiches: Jeni's ice cream sandwiched between two soft, chewy, and flavorful almond-based macaroon cookies. 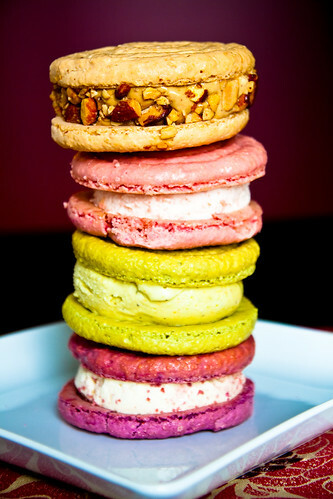 For the longest time, you could only get these macaroons at Jeni's shops in Columbus. I remember once calling the shipping department and asking Tom Bauer (Jeni's brother-in-law and business partner) if they can ship the macaroons, but the response was a "sorry, we can't." He said they didn't have a way to ship the macaroons that maintains their texture. That was a few years ago. 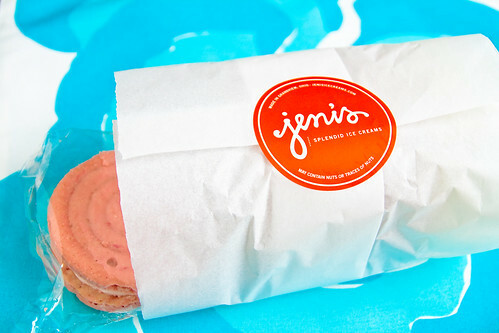 Fast forward to around March of this year, and the ice cream gods finally answered my prayers - Jeni's began offering macaroons for mail order! Of course, it took me no time to place my first macaroon order, which came in a collection of four different flavors Jeni called "Bakeshop." They didn't last long in my freezer. The Bakeshop Macaroons from back in the spring. 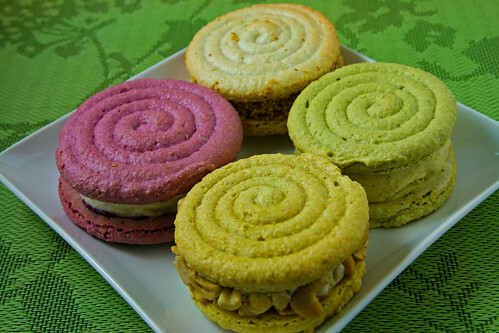 I was particularly delighted to see the Cashew Curry Banana Macaroon in the collection as I have been craving it since the last time I had something similar (only without the cashew) back in 2007 or 2008, during a visit to Columbus. It was the main reason I had called Jeni's asking about getting the macaroons shipped. 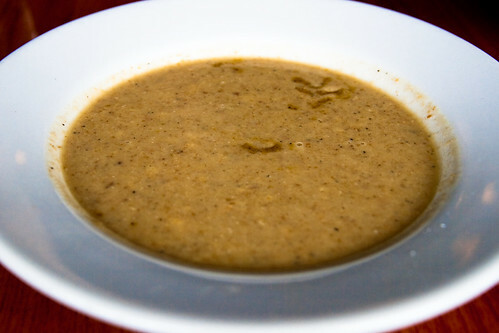 I absolutely love the combination of curry and banana together! The macaroons come in a little box. The current iteration of Jeni's macaroon collection, from top to bottom, is as follows: Salty Caramel with Smoked Almonds Macaroon, Strawberry Buttermilk Macaroon, Pistachio Macaroon, and Orchid Vanilla Macaroon. And now, let me now introduce the four flavors individually. 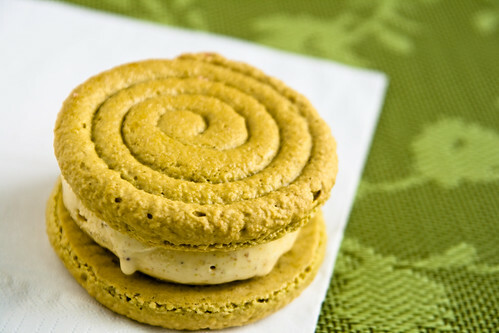 The Pistachio Macaroon is made with a rich Pistachio and Honey ice cream. If you like pistachios, you will love this ice cream, and you will definitely love this macaroon! And because Jeni's doesn't use artificial coloring, the moss-greenness of the macaroons are achieved by using Matcha green tea powder and turmeric! 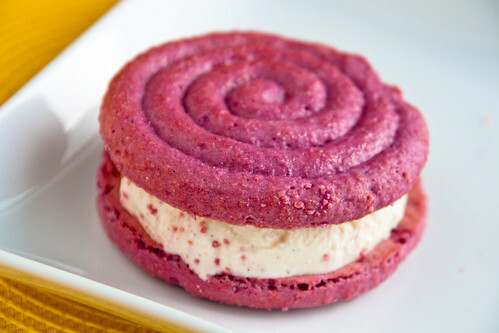 Orchid Vanilla Macaroon is an interesting one, with a dollop of black currant jam atop Ugandan Vanilla Bean ice cream, adding a bit of fruity tartness to this macaroon. 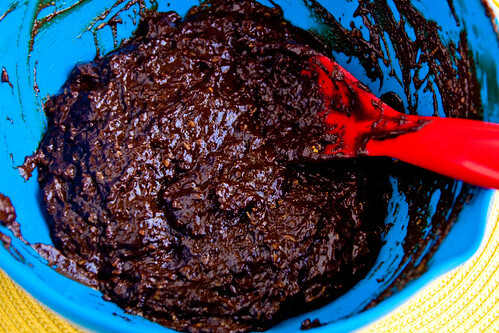 Purple coloring made possible by beet powder, black carrot powder, and beta-carotene powder. 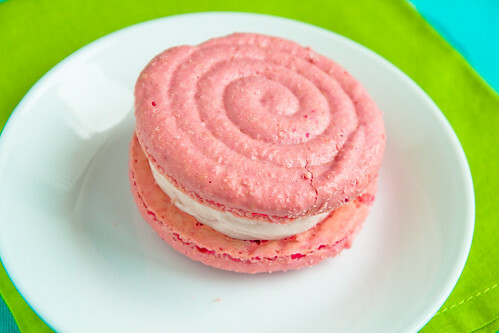 The Strawberry Buttermilk Macaroon is the new addition to the macaroon collection, with their very delicious Strawberry Buttermilk ice cream that's only available in the summer months when strawberries are in season. 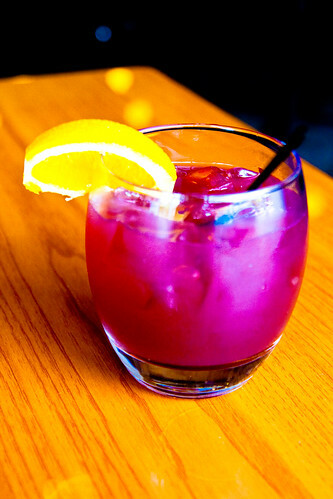 The pink coloring comes from red beet powder and beta-carotene. I saved the best for last. 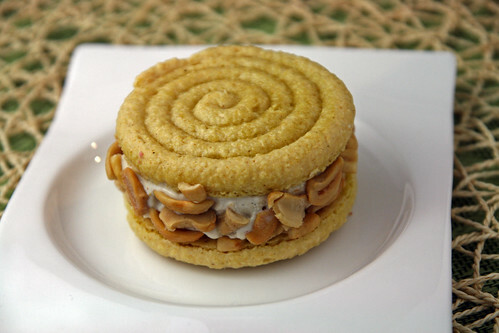 My favorite flavor of the collection is the Salty Caramel with Smoked Almonds Macaroon. The Salty Caramel ice cream is one of Jeni's most popular flavors, for good reason, and it is one of my all-time favorites as well. 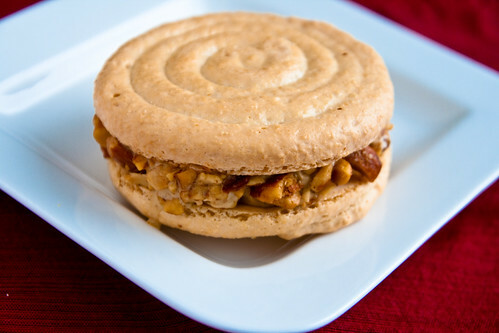 This macaroon also features chopped smoked almonds and it is soooo delicious! Jeni's, Columbus is so lucky to have you, and I am so lucky to have the internet and UPS! On a sunny Monday I took my sister to Conflict Kitchen in East Liberty for lunch (the only time they are open). I had always been intrigued by the concept and thought my very socially conscious sister would be just as equally intrigued. I'm not sure if she really was, but she went along with the idea anyway. (Thanks, sis!) 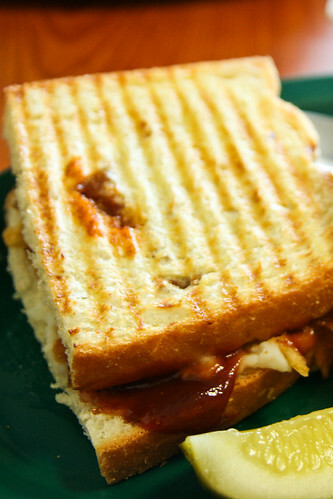 In case you are not familiar with Conflict Kitchen, it is a window-front takeout-only restaurant that shares a kitchen with The Waffle Shop next door (both are projects by the Carnegie Mellon University). 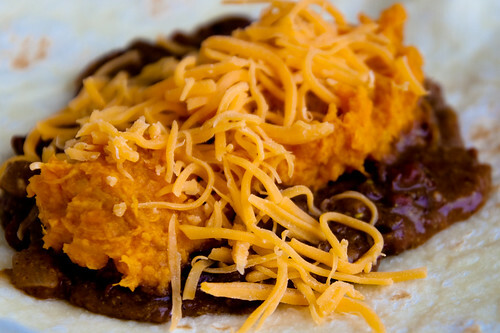 It serves one item and one item only at one time, from a country with which the United States is in conflict. Hence the name, Conflict Kitchen. The idea is to spark conversations about countries that people likely know little about but yet perceive negatively. 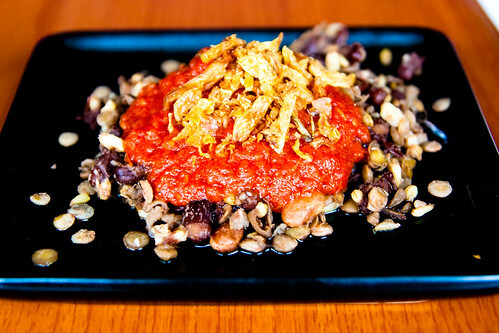 When Conflict Kitchen first started about a year ago (before my time in Pittsburgh), the feature cuisine was from Iran. By the time I discovered this place, they had moved on to Afghanistan, which is the feature country currently until the end of June, when they will switch to Venezuela. The work-study student who served us mentioned that North Korea would be next. I've mentioned before that I'm a culture nerd; naturally, then, the first thing that piqued my interest about Conflict Kitchen is its goal of bringing awareness to the countries and cultures that we know little about. Secondly, I love sampling food from different countries, and food from such cuisines as Afghan and Venezuelan is definitely something worth checking out. And third, being a nerd in general, I love supporting University-initiated projects that involve students and enhance their college experiences, and this one is certainly a worthwhile cause. 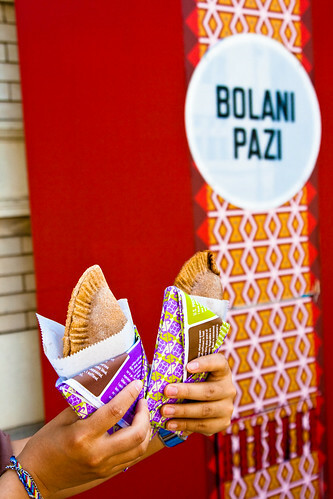 For its Afghan iteration, Conflict Kitchen is serving Bolani, which is a turnover with a crispy crust and a savory vegetarian filling. I had hoped to try the pumpkin, but alas, they were out of it. Instead, I settled on the spinach while Lil Sis got one with the potato and leek filling. Each was served with a little container of Greek yogurt for dipping, which admittedly was actually a bit tough to do as the bolani was wider than the opening of the dipping cup. Regardless, for $4 per bolani ($7 for two), it was pretty inexpensive. I'm thinking Conflict Kitchen may not be breaking even here, so I certainly wouldn't complain about the price even if it were a bit higher. The taste of the filling was on the subtle side but the yogurt was a nice complement. I'll admit it is hard to assess a food for which you have had no prior experience or knowledge whatsoever, and something prepared by students (not paid chefs) at that, but overall I enjoyed my bolani and the concept of Conflict Kitchen. One thing I regret is that we were in such a hurry to finish our bolani that I had forgotten all about reading the wrapper! The wrappers are especially designed with interviews and other information about Afghanistan. 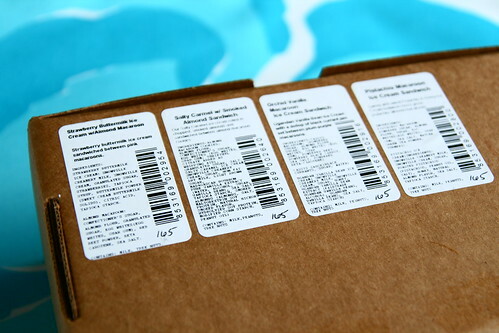 Luckily, a picture of the wrapper is shown on their website, and I was able to read most of it by squinting really hard. Next time I go to Conflict Kitchen (which I plan on doing as I'm definitely curious about Venezuela and Venezuelan cuisine!) I will have to remember the wrapper! 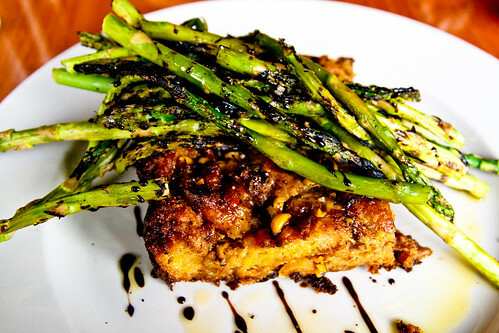 If you haven't checked out Zuppa's yet, you most definitely should! It was time to return to Pittsburgh last Saturday with my sister in tow who was to spend two days here. We drove straight from Toronto to the Church Brew Works where R. was waiting with his brother and sister-in-law, who were also in town visiting that day. The Church Brew Works is a brew pub, and a pretty cool one as far as I can tell. As an old cathedral converted into a brewery-slash-dining establishment, it definitely has a unique atmosphere and worth visiting at least once. Seeing that I'm not at all a beer drinker, however, I really don't have much to say about the beer, except that the beer enthusiasts at the table shared the beer sampler and enjoyed most of the selections. As for food, I really wasn't quite sure what to expect with it being a pub (which sadly often means "don't expect too much out of the food") and having seen some mixed reviews. I decided to go the safe route and ordered The Greek Wrap which had been recommended by two separate sources. 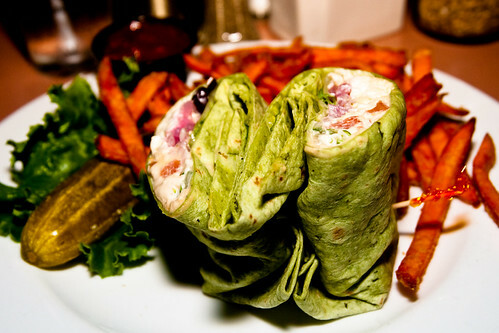 The spinach wrap was stuffed with hummus, cucumbers, kalamata olives, pickled red onions, feta cheese, tomatoes, and romaine lettuce with lemon-olive oil vinaigrette. It wasn't too bad. I also requested that the side be upgraded to sweet potato fries, which came with a deliciously spicy chipotle-ketchup. I was pretty satisfied with my choice. I had wanted to try some of their special Alligator and Plantain Pierogies, but alas, they had just sold the last of it. 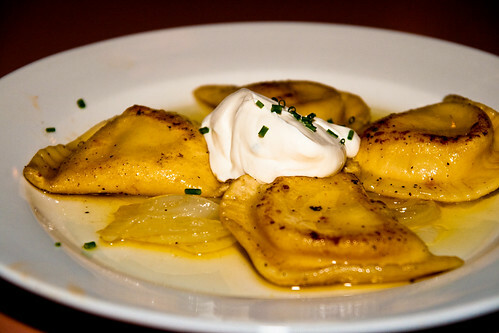 Instead, I had a few bites of Lil Sis' Traditional Pierogies, which she learned quickly is a Pittsburgh staple. These were your basic potato and cheese pierogies served with sautéed onions, melted butter, and sour cream. 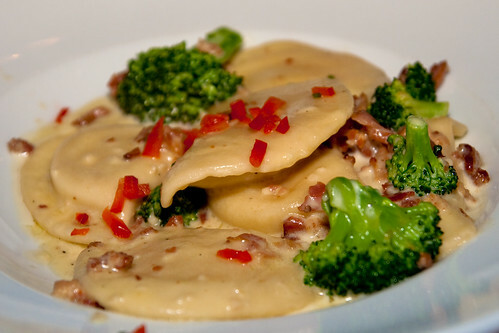 I also had some of R. and his brother's Pierogie Sauté which were Sautéed potato and cheese pierogies served with applewood smoked bacon and broccoli in a garlic cream sauce. Both the traditional and the special sautéed pierogies were quite good. I surveyed everyone about their food and all were satisfied. The menu is perhaps a bit too "pubby" for my taste, but it seems they do have some interesting specials (as long as they don't run out of them! ), and the idea of dining and chugging beer in a church is enough reason to check this place out. I see this as a place I might take a beer loving tourist for a casual meal. On my last full day in Canada, the family made a three-hour trek each way to Kingston, Ontario, for my brother's graduation. For our celebratory dinner, Lil Bro picked Chez Piggy, a distinctive restaurant he's heard a lot of but never had a chance to try. I'm not quite sure how to classify Chez Piggy. The menu prices are on the high side, and while the restaurant is beautiful, it is rather rustic and the servers dress in casual plaids as though they work at Cracker Barrel. This is not so much a complaint as just an observation that the prices don't quite match the feel. Having read mixed reviewed online prior to our visit, I also wasn't quite sure what to expect for the food. Turns out, the food was exactly like the reviews - mixed. Readers of my blog know I tend not to write about negative experiences as that's not what this blog is about, and I decided that, despite the few notable "misses" (including the sangria we shared and my Indian Curry Sole, which was a special that evening), the "hits" were actually really quite good, so I'm going to focus my post here on the positive aspects of Chez Piggy. Dad and Lil Bro both went with the Table d'Hote, the nightly three-course special which on this day came with a Duck Liver Pate as an appetizer, Lamb Shoulder as the entree, and a choice of any dessert on the menu. It was quite a good deal. I would have gone for this option if they had offered something other than lamb for the entree (not being a fan of lamb myself). Being a family that likes to eat family-style, I pretty much got to try a bit of everything. 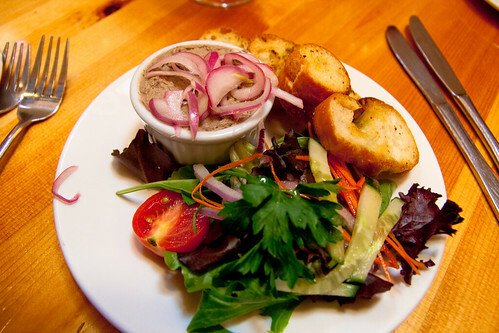 I had several bites of the Duck Liver Pate and it was absolutely delicious! Then I even tried some of the lamb. It was very tender, which was good, and the only qualm I have about it is my own dislike for lamb itself, so it's more of a personal preference issue than anything else. I do think they did a great job with the lamb. I also had some of Lil Sis' Memphis Pork Back Ribs with Elvis Sauce. 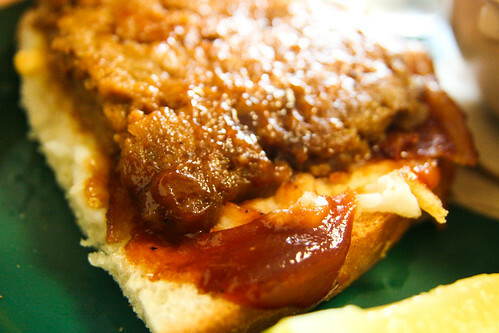 I still don't know what "Elvis Sauce" was, but it was pretty good. 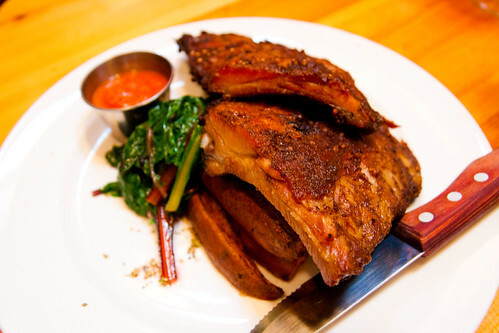 The ribs were well-spiced and tasty as well. 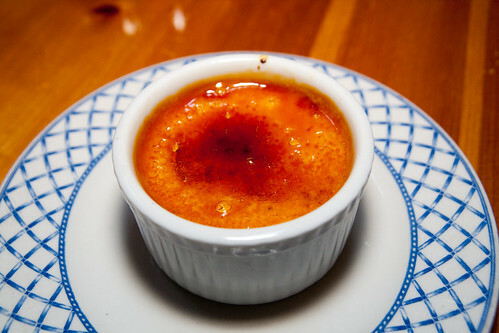 After our entrees, I stole a few bites of Dad's dessert: Vanilla Bean Creme Brulee. It was fabulous. And last but not least, the highlight of my meal: My Lemon Coconut Cheesecake with Rhubarb Compote, which was a special. 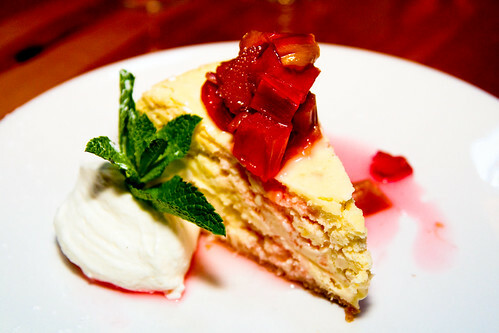 This cheesecake had a fluffy texture and a delicious blend of coconut sweetness and lemony-rhubarb tartness. It's making me hungry just thinking about it. 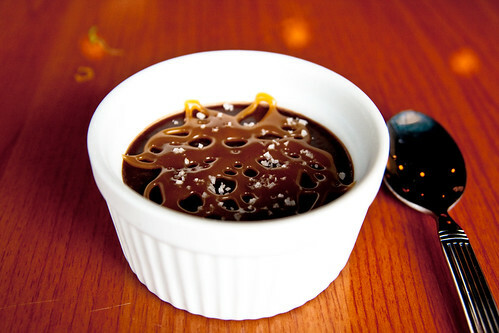 Chez Piggy scores an A+ on this dessert! Overall, it is a bit unfortunate that Chez Piggy's food is on the inconsistent side so you never know what you're going to get, but when they do a good job, they do a real good job.